Justin just moved to D.C. and is happy to be in the city so that he can chase his dreams and learn things. Justin volunteers because he wants to do whatever he can in order to be a helper for WIT! He wants to watch as much improv as he can and at the same time learn about how all of WIT operates. Justin loves that he gets the chance to meet people he aspires to be like when he grows up, and he thinks that’s pretty cool! 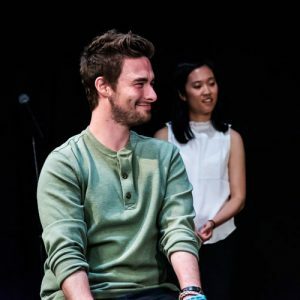 He’s been lucky enough to be a part of Improvapalooza both as a volunteer and a performer, and it’s something that he is so happy about that he smiles every time he thinks about it!! Justin looks forward to learning a lot from WIT’s happy people! Currently, Justin works on an educational farm doing all sorts of things. Sometimes he spends his whole morning pulling hornworms off the tobacco! Other times he wanders around eating fresh figs or pawpaw he finds in the field near the parking lot. But his main job is to educate visitors about environmental issues, Maryland’s colonial history, and sustainable farming practices. He does this all while portraying fun characters like a colonist named Samuel or Hank the Time Traveler! As far as talents go, he can do a George W. Bush impression that makes his Aunt Francine laugh. Justin is a nice guy and he wanted to be a NASCAR driver, but that didn't happen so now he's not one. Justin was a part of Backstage Players Improv team in college and he had a lot of fun! He went to that college for acting and they gave him a degree. He is a part of the FIST/indie team 37Puppies and has done lots of shows around D.C. He completed the WIT curriculum in 2018 and has studied at iO Chicago. He has done lots of plays and musicals!